Researchers unveil a new technique for studying neural connections in vivo in a recent study into Down syndrome. Transplanted human brain cells (green) and their nuclei (purple). Recent research, led by Vincenzo De Paola of Imperial College London (UK), which set out to examine the differences in the development of neural contacts in people living with Down syndrome, has established a method of studying the connections between human brain cells in vivo. 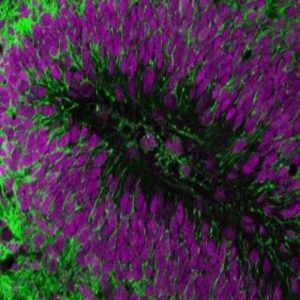 The team successfully transplanted human brain cells into a live mouse brain to be studied by a novel microscopy technique that is capable of visualizing the cells and their connections at a higher resolution than any prior screening method. To obtain the cells the team took skin cells, donated by people with Down syndrome, and manipulated them into brain cells in the lab. The cells were then programmed to allow them to be monitored by a revolutionary imaging technique known as two-photon microscopy. These cells were then transplanted into the brains of live mice and were monitored as the neurons grew and developed connections. These results were then compared to cells taken from subjects without a neurodevelopmental disorder. The results showed that the connections developed by the Down syndrome cells were more stable and numerous than those from the control cells, and were less coordinated in their communications. “Our results suggest the reduced coordinated activity and increased stability of connections in Down syndrome may be linked to cognitive function. Figuring this out would be an important piece of the puzzle, and we hope to have an answer soon,” De Paola explained. The next step for the research is to refine the technique and establish just how homologous the transplanted brain cells are – in structure and complexity – to natural human brain tissues. This method can then be used to study a variety of neurological disorders such as Parkinson’s and schizophrenia.